For something so simple as creme brulee I wondered why so many recipes turn four ingredients and few basic steps into a cooking challenge. 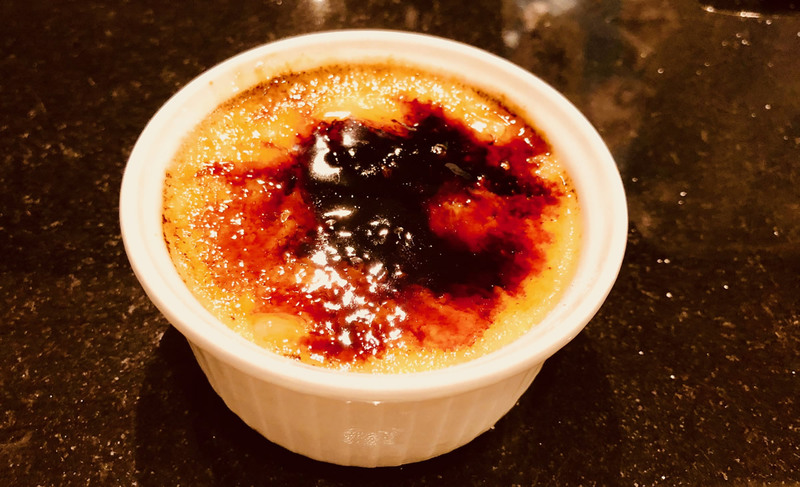 Here is my easy recipe for creme brulee adapted for Australian conditions. The key to success is to use high quality ingredients and avoid curdling the custard by overcooking. Vanilla bean paste tastes and looks the same as using whole vanilla beans, but it is a whole lot easier. Follow these simple steps and it is hard to go wrong. 600 mL (1 large carton) of fresh single cream (35% milk fat). 1/3 cup (75 g) of white sugar. 1 teaspoon of vanilla bean paste (important). Preheat the oven to 160˚C. Boil 2 L of water in an electric kettle. Pour cream into a small saucepan and add the sugar. Heat slowly to the point just before boiling (don’t let the cream boil). While the cream is heating seperate 6 egg yolks into a medium size bowl and add the vanilla bean paste. Mix with a hand whisk (or fork) until the vanilla and yolks are combined (10 seconds). Once the cream reaches near boiling, remove and pour slowly into the yolk mixture whisking gently the whole time. This should take about 20 seconds. Pour the thin custard through a fine sieve into a glass 1 L or larger jug. This will remove any egg lumps and make it easer to pour into the ramekins (i.e. the small ceramic bowls). Place 4 to 6 ramekins in a metal baking tray that is 10-15cm deep. Pour the custard into each of the ramekins and place the whole tray in the hot oven. Pour in the boiling water until it comes 2 cm from the top of the ramekins. It is easier to pour in the boiling water when the tray is in the oven than trying to move a tray filled to the brim with boiling water. Bake for 30 min. Remove the ramekins and let cool on the bench (30 minutes). Wrap each ramekin with plastic wrap and place in the fridge for at least 3 hours. Just before serving remove from the fridge, add two teaspoons of any sugar on top of the custard, shake gently to evenly distribute the sugar, and then blacken the sugar with a butane blowtorch. You can also use the oven grill, but it will tends to heat the custard a bit more than using a blowtorch – also blowtorches are fun. Serve immediately to your impressed guests or family. I was making Caesar Salad last night and managed to split the mayonnaise while making it – this is pretty easy to do if you add too much oil too fast. The simple way to fix this problem is just to start again with a new egg and slowly whisk back in the split mayonnaise – the only requirement for this rescue is that you have an extra egg. Of course as fate would have it I had no more eggs. At this point I was faced with making an emergency trip to the shops to buy more eggs, but then it occurred to me to see if I could rescue the split mayonnaise with dijon mustard. I tipped out the split mayonnaise, added around a teaspoon of dijon mustard to the jar, and then slowly added back the split mayonnaise while whisking the whole time. Thankfully it worked and I ended up with nice unsplit mayonnaise. The flavour was not too bad either.